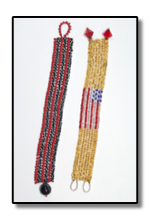 The history of bead work around the World is quite colorful it's self. Just about any country you travel to has a history rich in the art of beads. 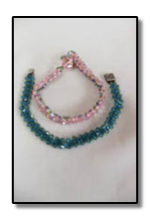 We have many informative and creative classes that cover all experience levels and types of beading. We'd love to have you join us for a fun filled and very rewarding class! Each month we'll suggest a creative project you can challenge yourself with that's sure to hone your artistic ability. Classes are scheduled by demand. Just call the Bungalow and let us know what class you are interesed in and we'll happily work with your schedule. need and their individual purposes. 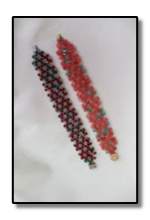 You will create a complete bracelet and matching earrings. 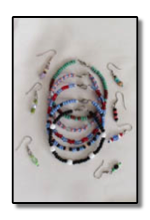 necklace, bracelet and earrings to match all your outfits and give as gifts! Supplies and tools are provided. 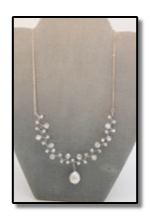 against your beads and keeps your pearls spaced equidistantly apart, creating the floating pearl look. today using silk or waxed lenin or leather. Learn professional Japanese pearl knotting techniques finished off with french wire. 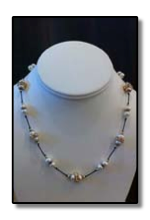 In this class you will learn how to discern the quality and types of Fresh Water Pearls. 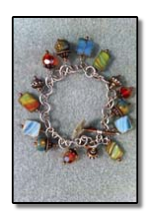 make a unique gemstone bracelet or beautiful charm bracelet. 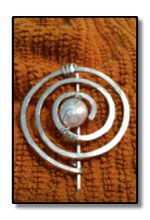 Learn to make your own designer headpins and earwires like a pro and save a ton of money on components. After this class, you can call yourself a true wire artist. and a hand made clasp adds the final touch. a simple ribbon. Dressed up or down, this is an original that you’ll be proud of. Have fun creating this sophisticated hammered lapel pin inspired by Alexander Spaulding. 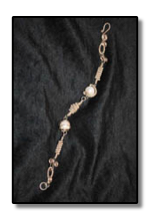 Dream with Julia as you create this one of a kind dainty twisted vine necklace with garnets or crystals. 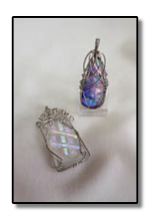 make two pendants. 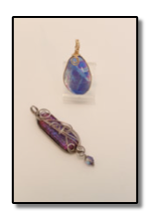 The first pendant is a simple double bail design constructed around a grooved cab. 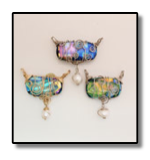 The second style is the free-form double bail pendant. 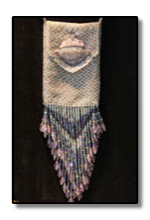 choice wrap is the reverse basketweave...it is a design is very impressive and fun to learn! 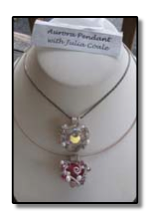 featured in this free-form wire pendant. 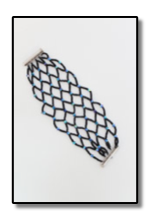 those having difficulty with the stitch or has been a while since you have used it and you need a review. lipstick, or decorate a pen! Makes great gifts! 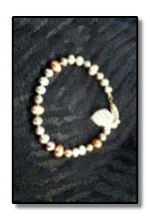 class and will have a truly impressive and eye catching bracelet to show for it! Everyone who takes this class and finishes their purse have an overwhelming feeling of accomplishment. down for generations in your family! 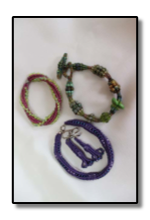 stitch that easily can accommodate your own patterns and design. 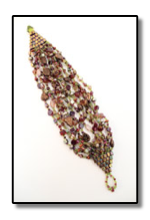 an undulating rope of beads that looks like a string of beaded beads. 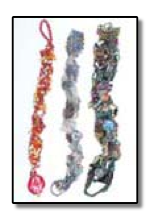 Use the basic netting stitch to create a multi-strand bracelet or necklace to showcase favorite beads. becomes the focal ornament. Netting experience is helpful buy not required. 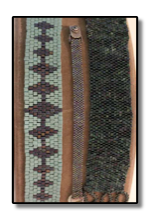 as desired to creat a wide cuff bracelet. a second spiral is worked as you go with the first. 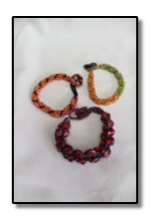 other crystal bracelets on your wrist! This is a hot new look with a very interesting design. 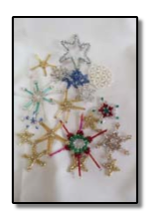 of three beads to achieve a geometric weave resembling a snowflake. of time they add real picazz to your jewelry. are endless! Make it a beaded Christmas! squares, rectangles, and cylinders to be incorporated in unique geometric designs.